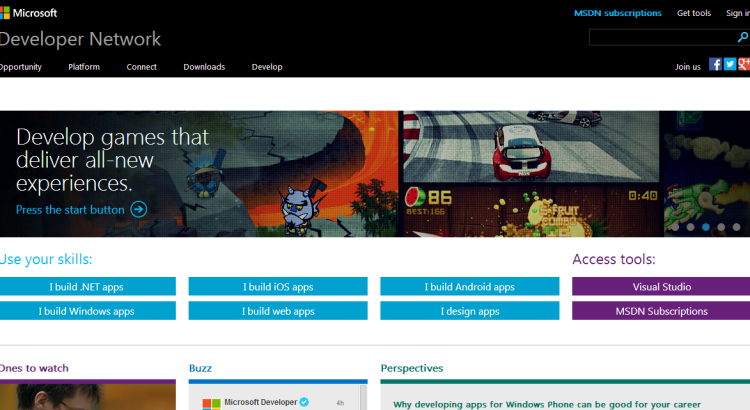 7 Reasons Why You Should Apply to 10000 Start-ups! 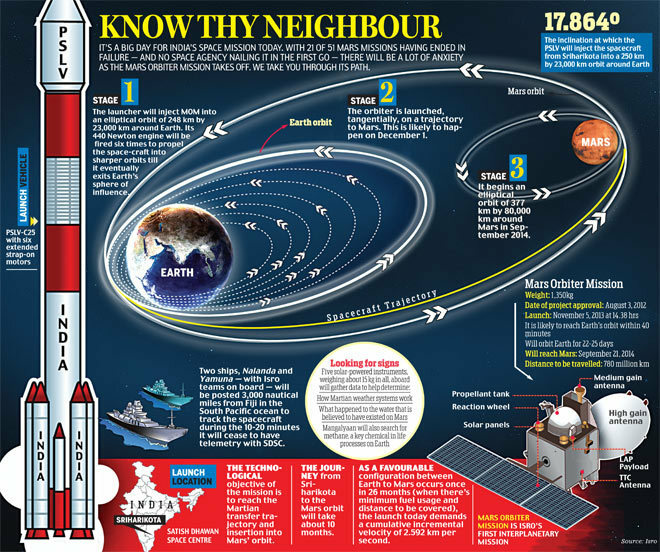 The spacecraft will go around Earth for 20-25 days in an elliptical orbit (perigee of 250 km and apogee of 23,500 km).The Rs 450 crore orbiter would then begin a nine-month long voyage to Mars around 12.42 AM on December 1.It is expected to reach the red planet’s orbit by September 24, 2014 and go around in an elliptical orbit (periapsis of 366 km and apo-apsis of 80,000 km). 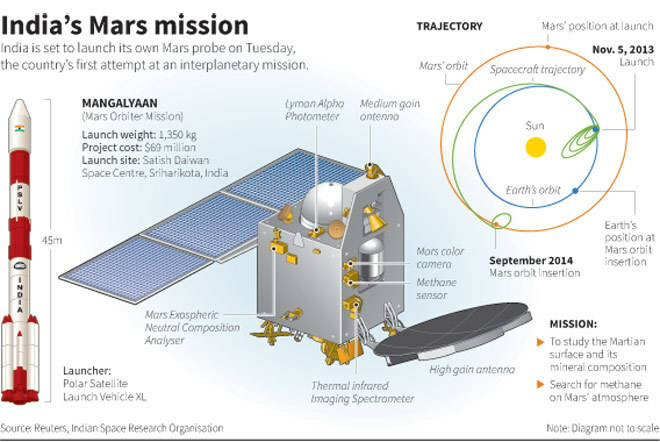 The Mars Orbiter has five scientific instruments – Lyman Alpha Photometer (LAP), Methane Sensor for Mars (MSM), Mars Exospheric Neutral Composition Analyser (MENCA), Mars Colour Camera (MCC) and Thermal Infrared Imaging Spectrometer (TIS). While LAP and MSM would help in atmospheric studies,MENCA would focus on studying particle environment.MCC and TIS would contribute to studying the surface imaging of the red planet. The 1,337 kg Mars Orbiter with 852 kg fuel has 15 kg of scientific instruments. 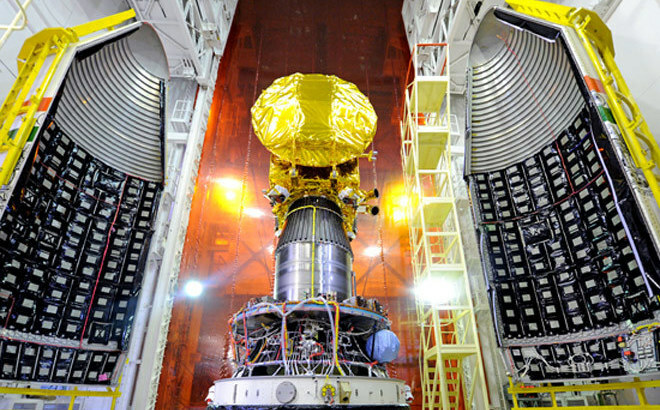 The Mars mission of the Indian Space Research Organisation ( ISRO) is aimed at establishing the country’s capability to reach the red planet and focus on looking for the presence of methane, an indicator of life in Mars. The vehicle trajectory will be tracked by monitoring stations at the Space Centre, Indian Deep Station Network at Byalulu near Bangalore and Down Range Station at Port Blair in India and also from Biak in Indonesia and Brunei. The main theme of the mission is to reveal whether there is methane, considered a “precursor chemical” for life, on the red planet. Methane sensor, one of the five payloads (scientific instruments) on board the spacecraft, would look to detect the presence. 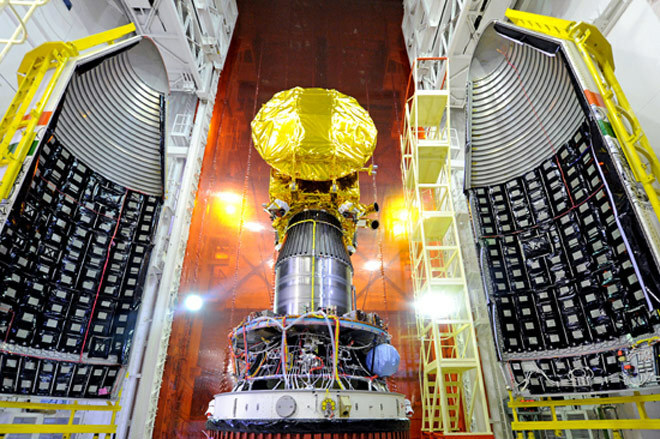 Two sea-borne terminals equipped with a 4.6 metre antenna and a 1.8 metre antenna on board Shipping Corporation of India’s SCI Nalanda and SCI Yamuna (some 2500 km between them) in South Pacific Ocean will track the vehicle as it injects the Mars Orbiter mission into Earth’s orbit. Once injected into orbit by the launch vehicle, the spacecraft trajectory post separation would be tracked from NASA’s Jet Propulsion Laboratory facilities at Goldstone (U.S), Madrid (Spain) and Canberra (Australia). After having received 33 ideas for instruments to be flown to Mars, ISRO shortlisted nine, of which the Advisory Committee of Space Sciences headed by Prof U R Rao finalized five instruments as only these were mature enough for the flight.